cosmetics | Oh, The Glamourous Life! When last we left our traveling showgirl, she was wending her way high into the Jemez Mountains with native guide Dr. Jen and faithful assistant Gia. I was welcomed to Dr. Jen’s adorable house in the woods, with wall to wall leopard print carpeting, by her three dogs: the famous Wallace, enormous puppy Stella, and Maya, who immediately figured out that I wasn’t a dog person, jumped up on me and planted a kiss on my nose. After enjoying the sunset and the scenery, I was happily ensconced in the Drag Room. Had I a middle of the night wig emergency, I would have been all set. 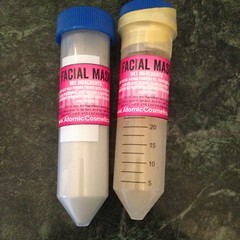 My Monday was spent in the Atomic Cosmetics lab seeing where and how the magic happens. This was a rare opportunity for me to get some makeup color matched and to make sure I’ve been using the right products for my skin. I’m starting to run out of my favorite colors of Shu Uemura eyeshadow and blush and it’s getting increasingly hard to get Shu products (they closed all their US stores, for example). So, Dr. Jen made me a matching set. She even improved on the original a little in that two of the colors were on the cool side and she gave me warmer shades that compliment my skin tones better. Also, we determined that I was wearing the wrong shade of BB cream. 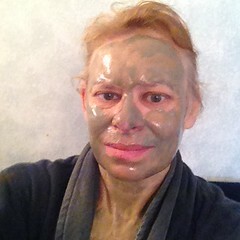 It wasn’t bad on me, but now I’ve got the same shade as my foundation and Nudie Cutie. It’s a subtle improvement. I forgot to mention that when Dr. Jen picked me up, she greeted me with a lip balm (with shimmer!) (also a two-color liquid lipstick). I pretty desperately needed that lip balm all the time. It is insanely dry in New Mexico. Dr. Jen also mentioned that she *might* have figured out a gel eyeliner and packed me up some samples when I told her that Pearl Button’s life would now be complete. Part of the day was spent with me on the phone (more on that later), but Dr. Jen had another guest who had come in from Texas (I think) to make lipstick. I got to watch the process of making the base, adding the pigment, &c. through to molding and putting it in a case. The new shade was dubbed “Red Velvet” and you can see it on my (dry, needing more balm) lips to the right. It was fascinating to see how eyeshadows are pressed, what pigments are to be used for which kind of cosmetic, the precision measuring, and what that big whisk is for. I’m so thrilled to have gotten an inside look at how the products are made. Next up: Time to go home. Or is it? 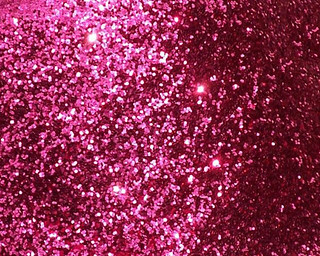 Use cosmetic-quality glitter on your face. Sure, you could pick up glitter at the craft store for way cheaper. But what’s it made of? You don’t want glitter of unknown origin near your eyes or, especially, on your lips. No matter how careful you are, you’re probably going to ingest some flakes over the course of a show. Make sure your glitter is non-toxic and made to be on your skin. Happy Friday! And best of luck to everyone performing at the Burlesque Hall of Fame this weekend! It’s better for them and for your eyes to give them the occasional cleansing. It’s easy and you only need a couple of items, which you already have (or should). 1. Take off your lashes. I know that sounds dumb, but falling asleep while still wearing lashes is not unheard of… When removing them, grab the edge of the band, not the lashes themselves! 2. Peel off excess adhesive. A little old glue can help the lashes stick better, but you don’t want a thick layer. Some recommend using tweezers, but I just use my fingernails to peel it off. Remember to hold the band, not the lashes when you pull off the glue residue. I’ve found latex-based glue comes off more easily than the non-rubbery stuff I use these days. 3. Put the lashes back on their plastic thingy. It will help them keep their shape during cleaning. 4. Dampen a cotton swab with a gentle eye makeup remover and gently brush it over the lashes from band to tip to take off the accumulated gunk. I like this remover from Atomic Cosmetics (of course). 5. 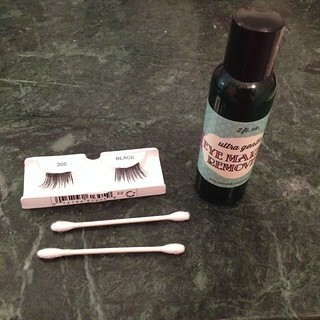 Dampen a second swab with a little water and repeat the process to rinse the lashes. 6. Let them air dry on the plastic form. That’s it! You don’t need to do this every time you wear your lashes, but occasional cleaning will keep your lashes looking good longer. And it’s got to be healthier for your eyes! When curling your lashes, move the curler from base to tip, gently squeezing as you go. This gives you a more natural curl than one sharp crimp. 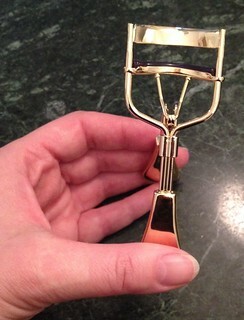 You knew this already, but open the curler to move it; don’t drag it down your lashes while it’s closed. Ouch. Happy Friday! I’m at BurlyCon right now, but I wouldn’t forget your tip. 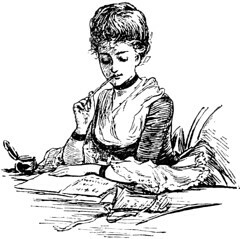 A sharp pencil is a more useful pencil. Keep your cosmetic pencils nice and sharp. A fine point will give you more control. Also, you’re exposing a fresh, clean surface. There are a couple of different sharpeners pictured above. There’s a traditional square one. 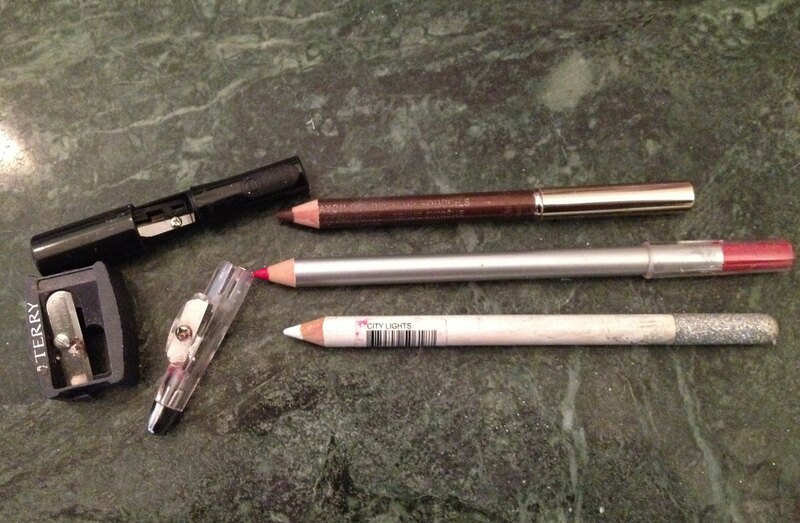 I also have one of those with a wide hole for fat pencils as well as a smaller one, but I have no idea where it is. The white pencil came with a cap with a built-in sharpener, which is very convenient, although you need to be careful handling it. The two-part one was a gift from Betty Blaize. It’s also a pencil cap with a built-in sharpener, but the blade is protected in a cover, so you don’t hurt yourself blindly groping around in your makeup case. Not that that’s every happened to me. I will confess, I came late to the false eyelash game. I didn’t like them the first time I wore them because no one had taught me how to properly fit and wear them. And that was that. No lashes for me. But I didn’t actually want to talk about lashes, I wanted to talk about glue. I used to get adhesive in a tube. I suppose some dexterous people can squeeze the glue directly onto the lash band without making a huge mess, but I’m not one of them. I would squirt some out, either too much or too little, into the lid of the tin where I store my lash paraphernalia, and then apply it to the lash with my sophisticated adhesive applicator — that is, the tip of a hair pin. It was messy & wasteful. Duo comes with a brush! This has made my life so much easier! I can brush exactly the right amount on without any waste. Bonus — the tube exactly fits in the above-mentioned lash storage tin. I know you are desperate to hear about my glitter-drenched weekend at BurlyCon, but first I have some serious stuff to tell you about. You all know about my deep and true love of Atomic Cosmetics in Seattle, healthy, non-toxic skin care and cosmetics, aimed at the burlesque & drag community, but with serious science behind everything. I went on a little shopping spree at BurlyCon — you’ll hear all about that later. I was devastated to get home and learn that the business was in financial peril! Dr. Jen is smart (Ph.D. in Biochemistry/Biophysics!) and talented and the business is expanding. However, they were counting on a business loan to fund that growth and it fell through. Without that money, the store can’t stay open. This would be a tragic loss! There’s a donation site set up, but it’s not just a hand out. In exchange for your donation, you’ll get a gift certificate for the same amount. These are really great products made by great people and I want to see the business grow and thrive. So, please, give them a try. I’m happy to recommend my favorite products. You can feel good about supporting an independent, woman-owned business *and* do something nice for your skin.